Oct. 30 – Singapore and Hong Kong have ranked first and second in the World Bank’s “Doing Business 2014” report. These Asian financial centers have retained the highest rankings for the past eight years due to regulations that facilitate the “ease of doing business” for small and medium-size enterprises. The World Bank report analyzes regulatory barriers to entrepreneurship in 189 economies, recognizing which countries are improving their business environment. The data is taken from surveys of over 10,000 professionals who are familiar with legal and regulatory issues in the country. The survey queries eleven areas of everyday business activity: starting a business, dealing with construction permits, getting electricity, registering property, getting credit, protecting investors, paying taxes, trading across borders, enforcing contracts, closing a business, and employing workers. China slid five spots this year to 96th place. Overall, the country has a low ranking for starting a business, dealing with construction permits, getting electricity and obtaining credit. However, the country is ranked 19th for enforcing contracts and 48th for registering property. Enforcing contracts has become easier as the government amended its civil procedure code to speed up court proceedings. In addition, China introduced new regulations guaranteeing borrowers’ right to inspect their data, which improved its credit information system. India, who has questioned the reports methodology, dropped two spots to 134th. Its highest rankings were in getting credit and protecting investors, while the lowest were in starting a business, dealing with construction permits, and enforcing contracts. Within India, New Delhi is the best city to start a new business. India’s ranking can be compared to South Asia’s regional average of 121. The ASEAN countries ranked disparately, with Singapore and Malaysia in the lead. Singapore continues to improve its regulatory environment, providing the most business-friendly environment for entrepreneurs. Malaysia jumped from 12th last year to 6th this year, its first time in a top 10 position. The country ranked first for getting credit, fourth for protecting investors, and fifth for ease of trading across borders. Its huge improvement is largely due to its streamlining of business procedures. The country has reduced company registration fees, established a one-stop shop for construction permits, introduced a minimum wage and taken measures to simplify the electricity installation process. The Philippines is one of the most improved countries in the past five years, vaulting 30 spots to rank 108th. This past year it made improvements to getting credit, paying taxes, and dealing with construction permits. Vietnam, with an overall rank of 99, scored highest in dealing with construction permits. The country made improvements in its credit information system, increased investor protection though greater disclosure requirements for publicly held companies, increased the minimum wage, and abolished priority rules for redundancy dismissals or layoffs. The rest of ASEAN was ranked as follows: Thailand 18th, Brunei 59th, Indonesia 120th, Cambodia 137th, and Laos 159th. 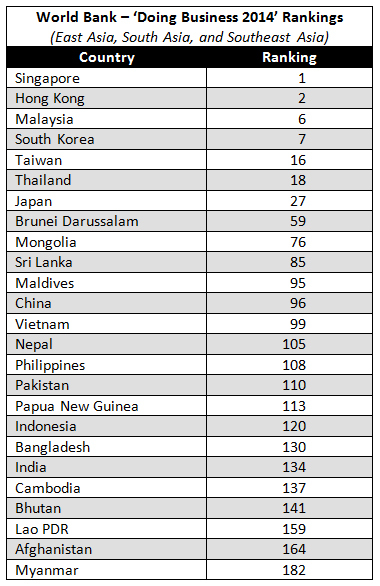 Myanmar, whose data was collected for the first time this year, ranked 182nd.